The establishment of national breast-screening programs in Europe and North America led to an increase in the detection of small or impalpable breast lesions. The ability to achieve an accurate histopathologic diagnosis of these lesions is crucial to any screening program in terms of appropriate treatment planning and patient counseling. Stereotactic breast needle biopsy refers to the sampling of nonpalpable or indistinct breast lesions by using techniques that enable the spatial localization of the lesion within the breast. The word stereotactic is derived from Greek and Latin roots meaning "touching in space." Stereotactic techniques have evolved in parallel with the trend in breast conservation and minimally invasive surgery. In the past, impalpable breast lesions would have been surgically excised after needle localization, resulting in a vast number of surgeries for nonmalignant mammographic abnormalities. In the United States, it is estimated that more than a million surgical breast biopsies are performed, and in only 15%-30% are the samples subsequently found to be malignant. Definitively diagnosing these lesions with needle biopsy has several advantages. For benign lesions, establishing a definitive diagnosis obviates unnecessary surgical excision or protracted follow-up, both of which are costly in psychosocial and resource terms. [1, 3, 4, 5, 6] A definitive diagnosis of cancer allows the patient to make an informed choice and to obtain counseling before surgery. It also facilitates in the planning of multimodal treatment in terms of neoadjuvant chemotherapy, the type of procedure, and early or delayed reconstruction. Because most of the lesions detected during screening are impalpable, subsequent needle biopsy must be image-guided. Ultrasonography-guided biopsy is usually the most straightforward approach, but lesions better seen on mammography images, particularly microcalcifications, require stereotactic localization. The principles of localization involve mapping the distance between the geometric center of the breast with the target lesion in two different planes and then projecting the coordinates onto the patient's breast (see image below). Stereotactic images obtained during a prone-table biopsy procedure. 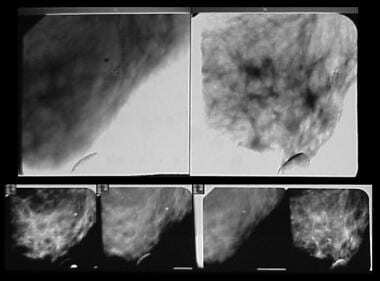 Earlier techniques in stereotaxis used mammographic projections to localize the target lesion within the breast. Advances in digital mammography have since superseded manual computations. Dedicated stereotactic equipment that performs localization with fixation of the breast is now in use (see image above). [8, 9, 10, 11] Stereotactic techniques have also been developed within other imaging modalities, including ultrasonography and magnetic resonance imaging (MRI). These techniques offer more options and greater flexibility in performing stereotactic biopsy. Digital tomosynthesis creates a three-dimensional (3-D) picture of the breast using x-rays. It has been approved by the US Food and Drug Administration (FDA), but it is not yet considered the standard of care for breast care screening and is only available in limited hospitals. It takes multiple x-ray pictures of each breast from many angles. The breast is positioned in the same way as conventional mammography but with limited pressure. The x-ray tube moves in an arc around the breast while numerous images are taken within a few seconds. The information is then relayed to a computer, which generates highly focussed 3-D images throughout the breast. In 2013, Hologic Inc launched the world's first 3-D breast biopsy option "Affirm 3D". The procedure can be of benefit in targeting lesions that cannot be easily detected on two-dimensional (2-D) imaging or when using other modalities. It is claimed to also target lesions faster and reduce patient procedure time. The breast is made up of fatty tissue and glandular, milk-producing tissues. The ratio of fatty tissue to glandular tissue varies among individuals. In addition, with the onset of menopause (ie, decrease in estrogen levels), the relative amount of fatty tissue increases as the glandular tissue diminishes. The base of the breast overlies the pectoralis major muscle between the second and sixth ribs in the nonptotic state. The gland is anchored to the pectoralis major fascia by the suspensory ligaments first described by Astley Cooper in 1840. These ligaments run throughout the breast tissue parenchyma from the deep fascia beneath the breast and attach to the dermis of the skin. Since they are not taut, they allow for the natural motion of the breast. A further indication is for repeat biopsy in cases in which previous biopsy results are inconclusive. This situation often occurs when the tumor has both benign and malignant or preinvasive components. Local anaesthesia is mainly used for stereotactic biopsy. Although core biopsy under ultrasonographic guidance has traditionally been the first choice for diagnosis of most breast lesions,  and it has improved the accuracy of image-guided needle biopsy in the diagnosis of impalpable lesions, the problems with underestimation and the potential for sampling error has led to more invasive and larger-volume percutaneous biopsy devices. The two main types are (1) vacuum-assisted biopsy devices, such as the Mammotome device and the Hologic ATEC device, and (2) image-guided single-cylinder excision alternatives, such as the INTACT device. The common denominator of these devices is their ability to sample larger tissue volumes. The Mammotome probe, for example, consists of an outer shell with an aperture at its end for collecting tissue. It is a single-insertion device that uses vacuum suction to pull the target tissue into the collecting aperture. The tissue is then excised by a rotating cutter. Multiple harvests can be performed 360º around the lesion while the probe remains in the lesion during the whole procedure. The vacuum device can be used under ultrasonographic guidance or stereotactic guidance, particularly for microcalcifications [14, 15] ; the patient is prone or upright with the use of certain units, with adequate room to accommodate the device. The vacuum devices are available in different sizes (eg, the Mammotome is available in 11g and 8g, the ATEC in 12g and 9g, and the Encor in 10g and 7g). Because vacuum biopsy removes more tissue during sampling than core biopsy, complete removal of the mammographic abnormality has been reported [17, 21] ; however, this is not always correlated with removal of the pathologic lesion at surgery. A localizing clip can be inserted if the mammographic lesion is small; this clip can potentially be removed during vacuum biopsy. Thus far, no cases or tumor track seeding has been described, although benign epithelial displacement has been described. The likelihood of this occurrence is probably minimized if the operator chooses to insert the probe into position rather than fire it into place. FNA results are reported as benign, suggestive of malignancy, or nondiagnostic. Aspiration of a benign cystic lesion should result in collapse of the cavity. Documentation of complete collapse by follow-up ultrasonography may be helpful in decreasing the incidence of recurrence. Persistence of a palpable mass and recurrence following aspiration are general indications for further workup. The technique of FNA is determined largely by individual surgeon preference, which may, in part, reflect hand size and strength. It is typically used for identifying the presence of metastatid disease in abnormal lymph nodes. A 21-gauge (green) needle is used most commonly, although in expert hands, a 23-gauge (blue) needle can yield as much information, with less discomfort and bruising. Some clinicians opt for a hand-held 10-mL syringe, whereas others prefer a 20-mL syringe used with a syringe holder. Syringe holders allow a vacuum to be maintained easily but can make control of the needle tip less precise. To perform FNA, the skin should be disinfected with an alcohol wipe, and the needle is passed through the lesion a number of times, while maintaining suction and steadying the breast tissue with the other hand. Appreciating the potential risk of pneumothorax is important when performing needle biopsies of the breast, and wherever possible, the needle should be angled tangentially to the chest wall. Continue sampling until aspirate is observed at the bottom of the plastic portion of the needle. Transfer the aspirate to slides. Spread the aspirate thin enough to visualize individual cells. The slides may be air-dried or fixed according to the preference of the local laboratory. Cytospin preparations of the aspirate may allow a greater number of slides to be made. A cytologist then examines the slide. The success of FNA biopsy is highly dependent on the expertise of the cytologist, as well as on accurate localization. In view of the limitations with FNA, core-needle biopsy was developed. The core needles are of a larger caliber than the fine needles and are mounted onto a spring-loaded device that allows small cylinders of tissue to be cut and collected within the notch of the needle. Technically, the best core-biopsy samples are obtained by using 14-gauge needles. The optimal number of passes required vary according to the mammographic appearances of the lesions being sampled, with fewer passes required for solid lesions compared with microcalcifications. Several investigators have shown that a minimum of five to six passes is required when sampling microcalcifications to minimize sampling error. [25, 26, 27] Specimen radiography is also required to ensure that representative calcifications are obtained (see image below). Comparison of the size of specimens obtained during core biopsy with a 14-gauge needle (left) and those obtained during vacuum biopsy with a 16-gauge needle (right). A few false-positive results are reported, and these are attributed to the removal of the lesion by means of core biopsy or a surgical failure to remove the lesion. The reported false-negative rate for malignancy with core biopsy is in the range of 2% to 6.7%, with a mean rate of 4.4%. [28, 29] These false-negative results are more likely to occur with microcalcifications. In the United Kingdom's National Health Service (NHS) Breast Screening Programme, the actual false-negative rate is more variable. [7, 30] This variation may represent the wide range of experience and expertise in the technique, as some units may still be moving from FNA to core biopsy. Although the vast majority of the published literature on stereotactic core biopsy involves the use of dedicated, prone-table biopsy units, better results have been reported in United Kingdom centers that switch from FNA to core biopsy by using upright stereotactic devices. [31, 32] With the advent of digital acquisition with upright stereotactic units, the accuracy could reasonably be expected to improve, and this improvement has certainly been the experience with early adopters of such systems (Evans AJ, personal communications, 2003). The main advantage of core-needle biopsy is that it enables histologic diagnosis, which is vital to the planning of subsequent surgery and treatment of the patient. Stereotactic core-needle biopsy using a 14-gauge needle is widely accepted to be sensitive (90.5%) and specific (98.3%) in diagnosing breast masses, compared with 62.4% and 86.9%, respectively, for FNA. Core-needle biopsy can also be used to detect in situ as well as invasive malignancy. In addition, the status of estrogen receptors in the samples can easily be ascertained. A Tru-Cut needle, ideally 14-gauge, is used for core biopsy. Because of the fibrous nature of much breast tissue, adequate samples are best obtained using a spring-loaded firing device, such as the Biopty-Cut system. The procedure is often less painful than FNA despite the wider-bore needle. After subcutaneous injection of local anesthetic, cores of tissue can be taken and should be fixed immediately in formalin. If the lesion contains calcification based on the mammogram findings, radiographs of the cores are taken to confirm the presence of calcification and that the cores are representative. The risk of bruising with wide-bore needle biopsies is higher than with FNA. For this reason, anticoagulants should be stopped, when possible, before biopsy and a pressure dressing is applied, usually for at least 24 hours. Often, the samples are large enough to allow detailed histologic assessment, including tumor type and grade and hormone receptor status, but sampling error may occur if the cores are not representative of the entire lesion. With vacuum-assisted core biopsy devices (Mammotome; minimally invasive breast biopsy [MIBB]), an 11-gauge needle is positioned using ultrasonographic or mammographic guidance, and targeted breast tissue is drawn, cut, and saved in a collecting chamber. The procedure is performed under local anesthesia. These devices are relatively expensive, but they may be an alternative to open surgery for the therapeutic excision of benign lesions less than 15 mm or for additional tissue biopsy in patients with microcalcification or borderline breast lesions. Complication rates of Advanced Breast-Biopsy Instrumentation (ABBI) procedures requiring medical or surgical intervention are significantly higher than those of core biopsy and vacuum biopsy, with rates of approximately 1.1% for ABBI and less than 0.2% for core biopsy or vacuum biopsy. Although the complete removal of a small malignant lesion does occur, positive margin rates of 19%-100% have been described. [10, 36, 37, 38, 39, 40, 41, 42] The cost has also been a subject of contention, as ABBI procedures are more expensive than any of the other percutaneous needle-biopsy techniques. Comparable health economic data on the comparative efficacy of image guidance modalities or needle-biopsy options may not be readily available. The costs of the consumables are not insubstantial compared with those of fine-needle aspiration (FNA). An evidence-based approach to the image-guided modality and appropriate sampling modality for particular lesion types, combined with health economic measures is required. Due considerations must also be given to patient acceptance and outcome measures. A United Kingdom multicenter study evaluating the health economics and cost-effectiveness of 14-gauge core biopsies and biopsies using the Mammotome with conventional or digital upright stereotactic units and a prone table is underway. The pathologic results should always be carefully evaluated in accordance to the level of clinical and radiologic suspicion in a multidisciplinary setting to ensure that the appropriate management decision is reached. Used in this manner, image-guided percutaneous needle biopsy can be used effectively to ensure that most palpable and impalpable breast lesions are diagnosed with accuracy and certainty. The technique is safe and performed with the patient under local anesthesia. The complication rate is low, this method reduces intangible costs due to physical and psychologic morbidity. What is stereotactic breast needle biopsy? What is the role of stereotactic needle biopsy in the diagnosis of breast lesions? What is the role of imaging in the performance of stereotactic breast needle biopsy? What is the anatomy of breast relevant to stereotactic needle biopsy? When is breast stereotactic needle biopsy indicated? What is the role of anesthesiology in breast stereotactic needle biopsy? What equipment in needed to perform breast stereotactic core biopsy? What is the role of fine needle aspiration (FNA) in the workup of breast lesions? How is fine needle aspiration (FNA) performed in the workup of breast lesions? What is the role of breast stereotactic core-needle biopsy in the workup of breast lesions? What is the role of stereotactic wide-bore needle biopsy in the workup of breast lesions? How is vacuum-assisted core biopsy performed in the workup of breast lesions? What are the possible complications of Advanced Breast-Biopsy Instrumentation (ABBI) procedures? What is the efficacy of breast stereotactic needle biopsy? Pettine S, Place R, Babu S, Williard W, Kim D, Carter P. Stereotactic breast biopsy is accurate, minimally invasive, and cost effective. Am J Surg. 1996 May. 171(5):474-6. [Medline]. Salami N, Hirschowitz SL, Nieberg RK, Apple SK. Triple test approach to inadequate fine needle aspiration biopsies of palpable breast lesions. Acta Cytol. 1999 May-Jun. 43(3):339-43. [Medline]. Hatmaker AR, Donahue RM, Tarpley JL, Pearson AS. Cost-effective use of breast biopsy techniques in a Veterans health care system. Am J Surg. 2006 Nov. 192(5):e37-41. [Medline]. Burkhardt JH, Sunshine JH. Core-needle and surgical breast biopsy: comparison of three methods of assessing cost. Radiology. 1999 Jul. 212(1):181-8. [Medline]. [Full Text]. Lind DS, Minter R, Steinbach B, et al. Stereotactic core biopsy reduces the reexcision rate and the cost of mammographically detected cancer. J Surg Res. 1998 Jul 15. 78(1):23-6. [Medline]. Lee CH, Egglin TK, Philpotts L, Mainiero MB, Tocino I. Cost-effectiveness of stereotactic core needle biopsy: analysis by means of mammographic findings. Radiology. 1997 Mar. 202(3):849-54. [Medline]. [Full Text]. NHS Breast Screening Radiologists Quality Assurance Committee. Quality Assurance Guidelines for Mammography: Including Radiographic Quality Control. Sheffield, UK: NHS Cancer Screening Programmes. April 2006. [Full Text]. Duijm LE, Groenewoud JH, Roumen RM, de Koning HJ, Plaisier ML, Fracheboud J. A decade of breast cancer screening in The Netherlands: trends in the preoperative diagnosis of breast cancer. Breast Cancer Res Treat. 2007 Nov. 106(1):113-9. [Medline]. Tate PS, Rogers EL, McGee EM, et al. Stereotactic breast biopsy: a six-year surgical experience. J Ky Med Assoc. 2001 Mar. 99(3):98-103. [Medline]. Velanovich V, Lewis FR Jr, Nathanson SD, Strand VF, Talpos GB, Bhandarkar S, et al. Comparison of mammographically guided breast biopsy techniques. Ann Surg. 1999 May. 229(5):625-30; discussion 630-3. [Medline]. [Full Text]. Becker W. Stereotactic localization of breast lesions. Radiology. 1979 Oct. 133(1):238-40. [Medline]. Sadler GP, McGee S, Dallimore NS, et al. Role of fine-needle aspiration cytology and needle-core biopsy in the diagnosis of lobular carcinoma of the breast. Br J Surg. 1994 Sep. 81(9):1315-7. [Medline]. Jackman RJ, Lamm RL. Stereotactic histologic biopsy in breasts with implants. Radiology. 2002 Jan. 222(1):157-64. [Medline]. [Full Text]. Sanderink WBG, Mann RM. Advances in breast intervention: where are we now and where should we be?. Clin Radiol. 2018 Aug. 73 (8):724-34. [Medline]. Esen G, Tutar B, Uras C, Calay Z, Ince U, Tutar O. Vacuum-assisted stereotactic breast biopsy in the diagnosis and management of suspicious microcalcifications. Diagn Interv Radiol. 2016 Jul-Aug. 22 (4):326-33. [Medline]. Jackman RJ, Burbank FH, Parker SH, et al. Accuracy of sampling ductal carcinoma in situ by three stereotactic breast biopsy methods. Radiology. 1998. 209P:197-8. Jackman RJ, Marzoni FA Jr, Nowels KW. Percutaneous removal of benign mammographic lesions: comparison of automated large-core and directional vacuum-assisted stereotactic biopsy techniques. AJR Am J Roentgenol. 1998 Nov. 171(5):1325-30. [Medline]. [Full Text]. Philpotts LE, Shaheen NA, Carter D, Lange RC, Lee CH. Comparison of rebiopsy rates after stereotactic core needle biopsy of the breast with 11-gauge vacuum suction probe versus 14-gauge needle and automatic gun. AJR Am J Roentgenol. 1999 Mar. 172(3):683-7. [Medline]. [Full Text]. Brem RF, Behrndt VS, Sanow L, Gatewood OM. Atypical ductal hyperplasia: histologic underestimation of carcinoma in tissue harvested from impalpable breast lesions using 11-gauge stereotactically guided directional vacuum-assisted biopsy. AJR Am J Roentgenol. 1999 May. 172(5):1405-7. [Medline]. [Full Text]. Jackman RJ, Burbank F, Parker SH, et al. Atypical ductal hyperplasia diagnosed at stereotactic breast biopsy: improved reliability with 14-gauge, directional, vacuum-assisted biopsy. Radiology. 1997 Aug. 204(2):485-8. [Medline]. [Full Text]. Liberman L, Dershaw DD, Rosen PP, Morris EA, Abramson AF, Borgen PI. Percutaneous removal of malignant mammographic lesions at stereotactic vacuum-assisted biopsy. Radiology. 1998 Mar. 206(3):711-5. [Medline]. [Full Text]. Liberman L, Vuolo M, Dershaw DD, et al. Epithelial displacement after stereotactic 11-gauge directional vacuum-assisted breast biopsy. AJR Am J Roentgenol. 1999 Mar. 172(3):677-81. [Medline]. [Full Text]. Casaubon JT, Regan JP. Breast masses, fine needle aspiration. 2018 Jan. [Medline]. [Full Text]. Boughey JC, Middleton LP, Harker L, et al. Utility of ultrasound and fine-needle aspiration biopsy of the axilla in the assessment of invasive lobular carcinoma of the breast. Am J Surg. 2007 Oct. 194(4):450-5. [Medline]. Rich PM, Michell MJ, Humphreys S, Howes GP, Nunnerley HB. Stereotactic 14G core biopsy of non-palpable breast cancer: what is the relationship between the number of core samples taken and the sensitivity for detection of malignancy?. Clin Radiol. 1999 Jun. 54(6):384-9. [Medline]. Brenner RJ, Fajardo L, Fisher PR, et al. Percutaneous core biopsy of the breast: effect of operator experience and number of samples on diagnostic accuracy. AJR Am J Roentgenol. 1996 Feb. 166(2):341-6. [Medline]. [Full Text]. Liberman L, Dershaw DD, Rosen PP, Abramson AF, Deutch BM, Hann LE. Stereotaxic 14-gauge breast biopsy: how many core biopsy specimens are needed?. Radiology. 1994 Sep. 192(3):793-5. [Medline]. [Full Text]. Lee CH, Philpotts LE, Horvath LJ, Tocino I. Follow-up of breast lesions diagnosed as benign with stereotactic core-needle biopsy: frequency of mammographic change and false-negative rate. Radiology. 1999 Jul. 212(1):189-94. [Medline]. [Full Text]. Jackman RJ, Nowels KW, Rodriguez-et al. Stereotactic, automated, large-core needle biopsy of nonpalpable breast lesions: false-negative and histologic underestimation rates after long-term follow-up. Radiology. 1999 Mar. 210(3):799-805. [Medline]. [Full Text]. Britton PD. Fine needle aspiration or core biopsy. Breast. 1999. 8(1):1-4. Britton PD, Flower CD, Freeman AH, et al. Changing to core biopsy in an NHS breast screening unit. Clin Radiol. 1997 Oct. 52(10):764-7. [Medline]. Litherland JC, Evans AJ, Wilson AR, et al. The impact of core-biopsy on pre-operative diagnosis rate of screen detected breast cancers. Clin Radiol. 1996 Aug. 51(8):562-5. [Medline]. Hodorowicz-Zaniewska D, Brzuszkiewicz K, Szpor J, et al. Clinical predictors of malignancy in patients diagnosed with atypical ductal hyperplasia on vacuum-assisted core needle biopsy. Wideochir Inne Tech Maloinwazyjne. 2018 Jun. 13 (2):184-91. [Medline]. Denton ERE, Michell MJ. Prone stereotactic core biopsy: results by mammographic sign in 640 cases. Presented at: Proceedings of the Annual Scientific Meeting of the Royal College of Radiologists Breast Group. 1998; Manchester, UK. Harter LP, Curtis JS, Ponto G, Craig PH. Malignant seeding of the needle track during stereotaxic core needle breast biopsy. Radiology. 1992 Dec. 185(3):713-4. [Medline]. [Full Text]. Ferzli GS, Puza T, Vanvorst-Bilotti S, Waters R. Breast Biopsies with ABBI(R): Experience with 183 Attempted Biopsies. Breast J. 1999 Jan. 5(1):26-28. [Medline]. Rebner M, Chesbrough R, Gregory N. Initial experience with the advanced breast biopsy instrumentation device. AJR Am J Roentgenol. 1999 Jul. 173(1):221-6. [Medline]. [Full Text]. Damascelli B, Frigerio LF, Lanocita R, et al. Stereotactic excisional breast biopsy performed by interventional radiologists using the advanced breast biopsy instrumentation system. Br J Radiol. 1998 Oct. 71(850):1003-11. [Medline]. [Full Text]. D'Angelo PC, Galliano DE, Rosemurgy AS. Stereotactic excisional breast biopsies utilizing the advanced breast biopsy instrumentation system. Am J Surg. 1997 Sep. 174(3):297-302. [Medline]. Kelley WE, Bailey R, Bertelson C, et al. Stereotactic automated surgical biopsy using the ABBI biopsy device: a multicenter study. Breast J. 1998. 4(5):302-6. Leibman AJ, Frager D, Choi P. Experience with breast biopsies using the Advanced Breast Biopsy Instrumentation system. AJR Am J Roentgenol. 1999 May. 172(5):1409-12. [Medline]. [Full Text]. Matthews BD, Williams GB. Initial experience with the advanced breast biopsy instrumentation system. Am J Surg. 1999 Feb. 177(2):97-101. [Medline]. Smith DN, Christian R, Meyer JE. Large-core needle biopsy of nonpalpable breast cancers. The impact on subsequent surgical excisions. Arch Surg. 1997 Mar. 132(3):256-9; discussion 260. [Medline]. Gentry CL, Henry CA. Stereotactic Percutaneous Breast Biopsy: A Comparative Analysis Between Surgeon and Radiologist. Breast J. 1999 Mar. 5(2):101-104. [Medline]. Liberman L. Advanced Breast Biopsy Instrumentation (ABBI): analysis of published experience. AJR Am J Roentgenol. 1999 May. 172(5):1413-6. [Medline]. [Full Text]. LaRaja RD, Saber AA, Sickles A. Early experience in the use of the Advanced Breast Biopsy Instrumentation: a report of one hundred twenty-seven patients. Surgery. 1999 Apr. 125(4):380-4. [Medline]. Ciatto S, Houssami N, Ambrogetti D, et al. Accuracy and underestimation of malignancy of breast core needle biopsy: the Florence experience of over 4000 consecutive biopsies. Breast Cancer Res Treat. 2007 Mar. 101(3):291-7. [Medline]. Pisano ED, Fajardo LL, Tsimikas J, et al. Rate of insufficient samples for fine-needle aspiration for nonpalpable breast lesions in a multicenter clinical trial: The Radiologic Diagnostic Oncology Group 5 Study. The RDOG5 investigators. Cancer. 1998 Feb 15. 82(4):679-88. [Medline]. [Full Text]. Ha D, Dialani V, Mehta TS, Keefe W, Iuanow E, Slanetz PJ. Mucocele-like lesions in the breast diagnosed with percutaneous biopsy: is surgical excision necessary?. AJR Am J Roentgenol. 2015 Jan. 204(1):204-10. [Medline]. Park HL, Hong J. Vacuum-assisted breast biopsy for breast cancer. Gland Surg. 2014 May. 3(2):120-7. [Medline]. Ouldamer L, Poisson E, Arbion F, et al. All pure flat atypical atypia lesions of the breast diagnosed using percutaneous vacuum-assisted breast biopsy do not need surgical excision. Breast. 2018 Aug. 40:4-9. [Medline]. Disclosure: Received honoraria from Hologic for speaking and teaching.